You voted. The results are in. The Office Newb – Jacqui Tom (a.k.a The Office Newb) offers you the latest tips, insight and stories about being the new kid at the office. Gen Pink – Elsya’s blog about being a twenty something woman, and letting others know how our generation is different than those before us. Pipe Dreams & Professions – This blog follows the journey of aspiring writer, Elle Field. It also brings you news from the literary world, book reviews, etc. Hard Knox Life – The personal blog of Dave Knox, a Brand Manager at a major CPG company. It is about the changing forces in marketing, media & technology. Watercooler – Home base for those who think about starting a career and ask themselves, what now? The Schiff Report – Tracks media coverage of Generation Y and related issues. It also includes original analysis. Personal PR – How the principles and theories, the practices and norms of public relations can work for you, your online identity, your network, your career. Young Frugal – Business and personal finance for Millennials. Newly Corporate – Work, life, and the pursuit of happiness for the young professional. 10.) (Tie) I Will Teach You To Be Rich – Personal finance blog for college students, recent graduates and everyone else — including entrepreneurship — for getting rich.For me Ramit’s blog is one of the best to go for personal finance advice and tips. I suspect many other Millennials feel the same and that’s why he made this list. His save $1000 in 30 days challenge is a very useful resource and a great place to start if you’re not familiar with his work. 10.) (Tie) Ben Casnocha – A blog about entrepreneurship, books, current affairs, and intellectual life. Ben’s blog has been a mainstay on my top 10 list since I started putting it together. The blog is consistently updated, and isn’t afraid to delve a little deeper than most Gen Y related blogs, and really make you think. If you’re unfamiliar with his work, which is stimulating whether he’s discussing business or ping-pong, the best of Ben is a solid place to start. 9.) The Rest is Still Unwritten – Tech News and Random Ramblings from a 20-something year old bachelor. And yet that description doesn’t even begin to encapsulate what David’s blog is about, which for me, his words (always completely transparent) embody his raw journey through life. I’ve recently become acquainted with David’s work as we have seemed to travel in different circles, and I’m glad I have. He discusses stuff other people are scared to put on paper, and makes ambiguity enthralling. This post is one of my favorites that resonates in so many ways. 8.) Modite – This blog gives career advice for a new generation of workers. 7.) Politicoholic – This blog is currently host to Nisha’s commentary about a wide variety of issues, mostly political and social. Like David and a few others remaining on this list, Nisha is another writer who I have recently become acquainted with. Her blog is a great resource for staying up to date on important political and social issues and the implications of those (on Gen Y or otherwise). When I really took notice of Nisha’s work was when she won Brazen’s “How Blogging Changes Lives,” contest with this brilliant piece: “Forget Careers. Blogging Changes Lives.” Really, read it. It’s astounding. 6.) The Creative Career – The transition from college into life in the big city, looking at how students can prepare for the ever-changing roles in communications, marketing and public relations. Allie’s blog is another that I have recently become acquainted with. Like Rebecca’s blog it is chock full of practical advice and tips you can apply to your life immediately. Her design (thesis) is clean and smooth, and her frequency of posts rivals most in this busy Gen Y crowd. What draws me in the most is the variety of different posts, all relevant, and invariably keeping me from getting burned out. This post showcases her solid practical approach about an issue relevant to Gen Y. 5.) Employee Evolution – Dedicated to helping the millennial generation answer the hard-hitting questions that come with the biggest transition of their lives. Ryan rounds out the other half of our only blogging couple to make the top 10 list. Employee Evolution has been on every previous list of the Top 10 Gen Y blogs, and I don’t envision it going anywhere, even with Healy’s partner in crime, Ryan Paugh, taking a different route. Ryan’s often the epitome of brazen and it definitely shines through in his posts and likely resonates with his audience. Here’s a gem. 4.) PR Interactive – A way for Meg to interact with other professionals, students, and professors in communications to further her (and your) knowledge and understanding about the PR field and industry trends. I think what I like most about Meg’s blog is that she lays it out on a platter, “Here’s what I am interested in right now. It’s probably relevant to you and you can relate to it so as I encounter these issues, feel free to glean insight from my experiences.” At least that’s the feel I get and it works, because she makes it interesting, she makes it work. She also does a great job engaging her readers and cares about your opinion. 3.) Work.Love.Life – Explores topics that range from career development and entrepreneurship to relationships, from personal finances to spirituality and community building. Like Modite, sometimes Work.Love.Life has been left off of my previous lists due to a lack of updates, but I love Holly’s work and am glad you voted her onto this list. I once stated that she takes authenticity and transparency to a new level, and I’m also learning you readers appreciate that (ala David’s blog at #9). Virtually every single post has three elements to them: The Holly-side, the Surface-side, and the Deeper-side. I think that’s what makes Work.Love.Life so fascinating and compelling is that we get to see someone (already interesting) engage real issues, what to do on the surface, and then it makes us want to dissect how we encounter similar issues and turn the lens on ourselves. It’s that third part, as much as her transparency that separates her blog in my opinion. 2.) Personal Branding Blog – Your #1 resource for personal branding online. this blog includes podcasts, interviews with experts, insightful articles, research reports, games and much more. I must admit that I was surprised that Dan finally got dethroned, as the Personal Branding Blog has held the top spot every week save the inaugural list, which went to Ben Casnocha. Dan’s re-design is phenomenal, now one of my favorite blog designs online, period. He’s still producing high-quality interviews with prime time players in personal branding, but he’s backed off 7 posts a week. Now, there’s a team of talented contributors each writing one post a week, and the blog hasn’t lost any steam. The latest Personal Branding Magazine is coming out soon, and it is always a must-read. I am continually impressed with the amount of time Dan is able to commit to personal branding, and if you’re looking to build your personal brand (and you should be), then look no further. So what blog was worthy of knocking the Personal Branding Blog off of the top spot? Here’s the jist: We hope the advice that we provide on this site, based on our own experiences and that of others will be helpful in your quest for the perfect job, house or roommate! But you can get the whole scoop here: About The Mad Grad. Why this blog continually escaped by reach is beyond me, because it really is a great resource for the Gen Y community. These ladies definitely have their pulse on negotiating all things in life after college. From office party etiquette, to ways to relieve stress at work, there’s plenty of relevant information to be had. Their breadth isn’t limited to issues at the office though, it expands to living on an entry-level salary, and meeting people in a new city. These are all things that matter to Millennials negotiating this daunting transition. ——————————-Compiling this list for my readers and the Gen Y community is something I take great pride in and takes me a significant amount of time (even with opening up votes to you guys).I want to first say that it was immense pleasure getting acquainted with some of these blogs I was less familiar with, and I look forward to reading and learning more from each of you. Please feel free to reach out and connect, and start a conversation with me.Second, I’m very glad we have some new faces on this list (as my bias was probably unintentionally skewing the list a bit). I think that the influx of new blogs will only serve to make this a much more competitive list, and challenge each of us to push ourselves to continue putting out great content. Thanks again to Ryan Paugh for introducing me to some new blogs for the initial ballot. Moving Forward: I’ve decided I will produce the list bi-monthly so the next list will go live April 1st. I will open voting near the beginning of March. 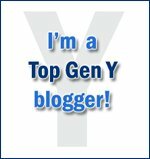 If you voted on this list, had your blog featured on this list, or are interested in the list in anyway and would like to receive notification when voting has opened (and when new lists come out) please send a blank e-mail entitled, “Gen Y Top Blogs,” to ryanstephens (at) gmail.com. I will not use your e-mail for anything other than what I’ve just specified, nor would I ever share it. Thanks for everyone for continuing to help make this list a great resource for the Gen Y community.